icypng-1, originally uploaded by stallio. a year ago i played around with databending PNG files and i accidentally stumbled across this great effect, with weird color blocks that smear all over the place. but PNG is one of the most difficult formats to bend without breaking, and i wasn't able to get very far with it. 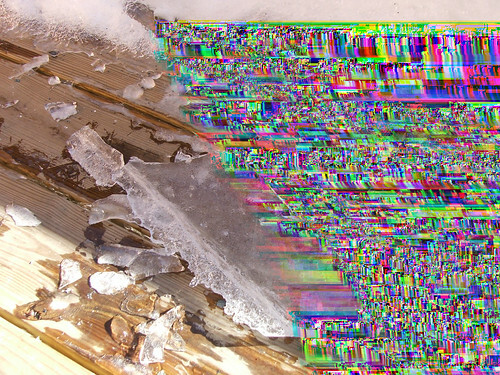 i've learned a lot about databending images over the past year, and decided to try again, this time with a hex editor, and figure out how to create this look. i haven't entirely gotten the hang of it yet, and need to practice more, but as you can see, i did eventually find a way to create this kind of glitch again. it's tricky, but i think it's worth it.